Clarence's identity is revealed and he and Jet have a showdown. The issue opens with a retelling of the decompression of the Jet backup copy from "Ghost in the Machine" Part 1. However, we get an extension of the scene and see that the Jet copy that materializes in the Electronic World then splits into 3 Jet programs, one blue, one red and one green. The story then jumps to now (.087621 seconds later). The now yellow Jet (a merging of the blue and red ones as seen in "Ghost in the Machine" Part 5) leads a fleet of Cruisers, pyramid ships and Recognizers through a "wormhole" into Clarence's Wonderland. He begins an assault on the seemingly tranquil paradise. Inside the castle, Clarence (now revealed as the green Jet) attempts to stop the assault and his Wonderland creatures take up arms against Jet's forces, even the flowers gaining machine guns. But it's futile and soon Wonderland is all but destroyed, torn down to its grid lines. Yellow and green Jets stand and confront each other on a piece of floating ground, hurling their identity disks at each other. Clarence tries to explain that all three Jets could have been happy and survived in their respective hallucinatory worlds. Clarence states he chooses not to die and hurls his disk again, but yellow Jet catches the green disk in midair and derezzes it in his hand. He explains that none of them are dead, they will merge and become one, as they should be. He grabs Clarence's hand and they merge in a flash like the big bang. The composite Jet finds himself floating in darkness. Then a bright light appears before him and he sees an image of his User...the real Jet Bradley. Jet explains that his time in the computer (in Tron 2.0) left a digital footprint of himself which was corrupted and created instability in the system. To compensate he divided the Jet copy into three separate packets with the Tron Legacy code in their subroutines, allowing them to function to a degree, making them alive. Now that the three have merged into one, the Jet copy is complex enough that he can be integrated into the real world. Jet explains that he, Alan, Flynn, and Lora are all waiting for the new composite Jet in the real world. He explains that Lora didn't really die, her mind is a part of Ma3a. The Jet program asks what will happen to this system when he leaves? Jet says that only the Tron Legacy code is holding it together right now and when the Jet program leaves, the system will cease to exist. The Jet program decides he can't allow that to happen, takes up his identity disk, and begins channeling energy into himself. In a flash, he finds himself lying on a "hill" in the Electronic World with Mercury. They are both wearing yellow armor with the classic circuitry look. Mercury says, "You're finally awake." Jet looks around him at the beautiful digital landscape and then picks up a cubic "rock" and stares at it with a straining look on his face. "What are you doing?" Mercury asks. "Checking to see if the cube will always be a cube." "Oh, good. You're still weird. I was worried." The Jet program gets up and says, "Let's go see our world." The art on pages 1-4 is redrawn by Michael Shoyket and Guru-eFX from original pages 2-5 of Tron #1 ("Ghost in the Machine" Part 1) by Louie De Martinis, with minor modifications to the scene. The text likewise is identical and then expanded in panels 4 and 5 of page 4. The scene depicts again the decompression of the Jet backup copy. Among the Recognizers and pyramid ships that emerge into "Wonderland" are a few Cruisers similar to Sark's as seen in Tron. 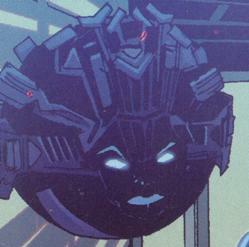 On page 6, a sphere with a face is seen floating on Jet's command cruiser. It seems most likely that it is Ma3a, though she looks a bit different than she did in Tron 2.0. Also on page 6, notice that all of Jet's bridge personnel appear to be female (including the Byte)! Notice further that the seated female appears to be fully human, not a program, having hair, Earth clothing, and eyeglasses. On page 8, we see that Clarence has two white rabbit suits hanging on a coat rack. As hinted at in Tron 2.0, we learn that Ma3a contains part of Lora's personality after she was derezzed in a laboratory accident. The real world Jet Bradley tells the Jet-copy that they are all waiting for him in the real world, including Flynn. This would seem to indicate that Flynn has returned from his mysterious 15-year disappearance described in Tron 2.0. Since it is revealed here that the Jet copy seen at the beginning of the entire "Ghost in the Machine" story immediately split into three copies of Jet which each lived in a different hallucinatory world, it would seem that the "real world" scenes depicted in various parts of the story were not in fact real.